Food. It’s simple to overlook, but it’s a serious part of everyone’s honeymoon and wedding. It’s something very few people consider before booking their flight to a faraway location with white sandy beaches and crystal clear waters. 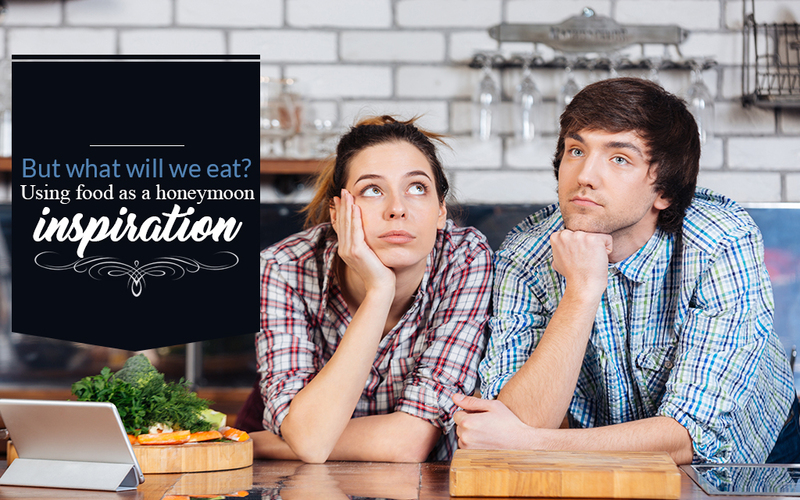 Let’s face it, there’s nothing worse than going on your honeymoon to find out there’s nothing to eat. Is the bride a picky eater? Does the groom not eat vegetables? Are there any food allergies to take into consideration? Is the bride scared of seafood? Does the groom have to have steak for every meal? While these questions may seem silly, they’re questions that every couple should take into consideration before booking a honeymoon or destination wedding. After all, your honeymoon is all about enjoying your surroundings and indulging your senses. Horseback rides on the beach aren’t any fun if you haven’t eaten for three days. Plan your entire trip around the gastronomy of the area. Is lobster his favorite? Does she just love Italian food? If you’re in the market for an overseas wedding or honeymoon, why not go to the source? Places like Rome or Florence are geared toward those with the sightseeing bug. Sicily or Milan are a bit more low key. Oh, and the shopping in Milan? Some of the best in the world. It’s always fun to eat authentic versions of your favorite meals. If you love paella, try it in Valencia, Spain. It’s likely to taste much different than any American version you’ve ever had. If you are a fish lover – vacation spots in the Greek isles will most likely offer the most delicious catch-of-the-day Mediterranean fish you’ve ever tasted. If you’re following your taste buds, you can’t go wrong. Choose a destination and work with your options. If you’ve already chosen a destination, it’s a good idea to call ahead and start requesting menus from different resorts. For instance, if you’ve decided on Maya Riviera, Mexico, you’ll have a range of different resorts to choose from. Call or e-mail each one and request a description of the different kinds of food they offer. Often, resorts will have different restaurants within the same hotel, serving different types of food in different atmospheres (traditional, casual, fast-food, snacks, formal, etc.) If a resort doesn’t offer the kind of noshes you like – it’s better to know in advance. Well, we’ve been to these places. We’ve eaten at the restaurants, and we can tell you what to look for and what to avoid. We’ve even taken cooking classes in places like Barcelona and Greece! That way, after your honeymoon, you can come back with authentic recipes that Rachael Ray couldn’t shake a spatula at.